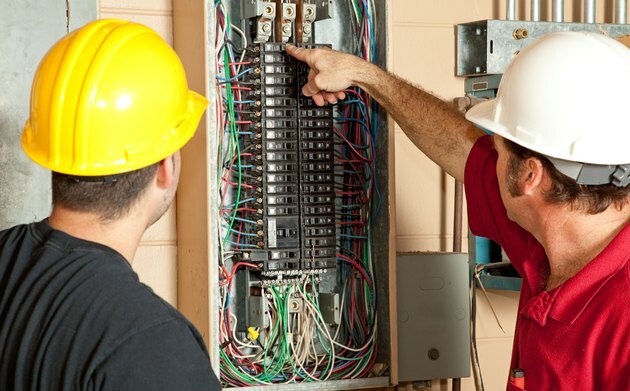 The National Electric Code, the benchmark for safe electrical design, requires a circuit breaker in all electrical circuits, whether commercial, residential or industrial. This is a necessary step to prevent both fires and the possibility of electrocution. However, in order for the circuit breaker to grant maximum safety, it must be sized correctly according to the current of the circuit. What Is a Circuit Breaker? A circuit breaker works by electromagnetism, energized by the power of the circuit. When the current of the circuit gets to a certain level, it "trips" the breaker, causing it to switch back and break the circuit, disconnecting the power. The "size" of a circuit breaker is the maximum current that can pass through the breaker without tripping the circuit and causing a loss of power. In other words, the breaker controlling a circuit should be 125 percent of the continuous load (maximum current expected to last for three hours or more) and 100 percent of the non-continuous load (shorter bursts of power, such as that needed to start up). For example, a 15 amp breaker would trip at 15 amps, although the maximum continuous load of the circuit is 12 amps. How Can You Calculate A Safe Circuit Load? In order to determine the right size of circuit breaker, you first must add up the current of all the devices on the circuit that are on continuously, such as lights. There will be a label on all electronic devices specifying the power they use in watts. To find the current draw, you just divide this number by the voltage at which it operates, which is either 120 volts or 240 volts. Then, multiply this number by 125 percent. An easy way to do this is to divide it by 100 and then multiply it by 125. The rating of your circuit breaker must be larger than this total. The bulk of breakers used is residential electronic circuits are 20 volts, although larger ones can be necessary for more powerful appliances. The amperage of a circuit breaker will be marked on its handle. Ideally, you want your circuit to be operating at 80 percent of capacity, which is called the safe load. You can calculate a safe load for a circuit breaker by multiplying its amperage by 0.8. A circuit can operate at a higher percentage, but not for long periods of time as this can compromise safety. Annie Walton Doyle is a freelance writer based in Manchester, UK. Her work has appeared in The Huffington Post, The Daily Telegraph, Professional Photography Magazine, Bustle, Ravishly and more. When not writing, she enjoys pubs, knitting, nature and mysteries. What Is the Rule for a Step-Up Transformer? What Gauge Wire Should I Use for Lights and Outlets?